Russian River is sort of that mythical brewery for me. Everything I have heard about them is top notch. I have listened to a couple of pod casts with Vinnie Cilurzo, the owner and brewer, and he seems like a nice enough guy that just loves beer. free run 6 femmes Each and every beer they brew gets rave reviews on the internet and from the American craft beer industry in general. So I made it a personal goal to try their beer. I currently have had the chance to try only three (Blind Pig IPA, Consecration, Pliny The Elder), all recently, of their offerings but each is appreciative of your senses and titilates them perfectly. But I didn’t try Blind Pig until last night when a friend of mine, during the day, stated that he thought Blind Pig was better than Pliny The Elder. I didn’t want to hear of it. Pliny seemed the pinnacle of all Imperail IPAs and, quite possibly, the best beer I have ever had!!! How could he speak blasphemy in the name of Pliny? He did. I had to figure out what would make him say something like that, especially after he gave Pliny such a great review on the site. I am not going to regurgitate my reviews of the two beers here but I will say that Blind Pig is definitely in the league of Pliny, just not better or as good. Now, that is holding it up to what I determine to really be a perfect beer. 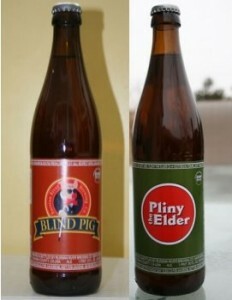 I thought the difference was in the fact that even though Blind Pig is an IPA, it wasn’t as balanced as Pliny. Still damn tasty. Enjoy! This entry was posted on Tuesday, March 16th, 2010 at 12:02 pm	and is filed under Beer. You can follow any responses to this entry through the RSS 2.0 feed. Both comments and pings are currently closed.